1 Cut zucchini in half horizontally, then cut each half into thin lengthwise strips (ribbons); set aside. 2 Melt Country Crock® Spread in large nonstick skillet and cook chicken with garlic over medium heat, stirring occasionally, until chicken is golden and almost cooked, about 5 minutes. Stir in zucchini and cook, stirring gently, until zucchini is almost tender, about 2 minutes. 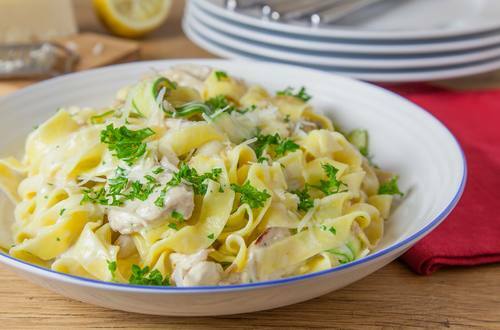 Stir in cream, Hellmann's® or Best Foods® Real Mayonnaise and 1/4 cup Parmesan cheese. Cook over low heat, stirring frequently, until heated through, about 2 minutes. Add fettuccine and toss gently with tongs, adding reserved pasta water if needed for desired consistency. Top with remaining 1/4 cup Parmesan cheese and garnish, if desired, with chopped parsley or basil.